My father, Edward N. Troisi of Maynard, Massachusetts, owned Juniper Hill Ski Area in Stow, Massachusetts from 1953 until the early 60’s. His partner was a Mr. Taylor from Sudbury. The area’s mechanic (a very important individual in the operation) was Richard McCoun from Concord. 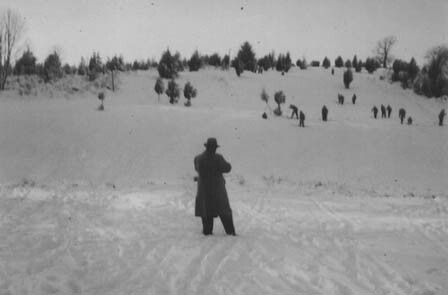 Juniper Hill consisted of a single rope tow with two “trails” to the skiers’ right of the tow. 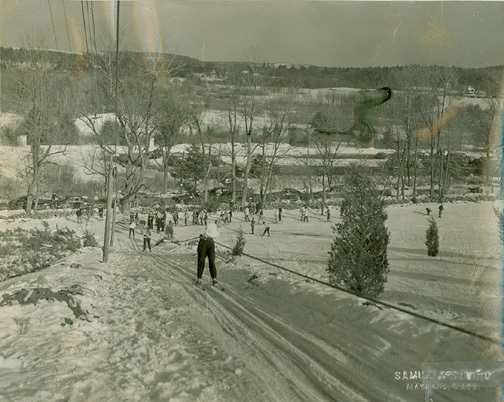 The rope tow’s first transmission and clutch were purchased from the Jericho Ski Club in Marlboro, Massachusetts. One trail was cut in winding fashion to mimic trails at New Hampshire areas. Parking was on the street, then later in a field across the street. Bathroom facilities began as two outhouses in that field (see photo to the right). Later a small lodge was built for food and indoor bathrooms. In it were served light sandwiches, and drinks made by my mother, Mary Troisi, and Richard McCoun’s wife, Helen. It was rather primitive by modern standards, with only a wood stove and crushed stone floor. A local skier/carpenter, Paavo Rutanen, built the lodge. 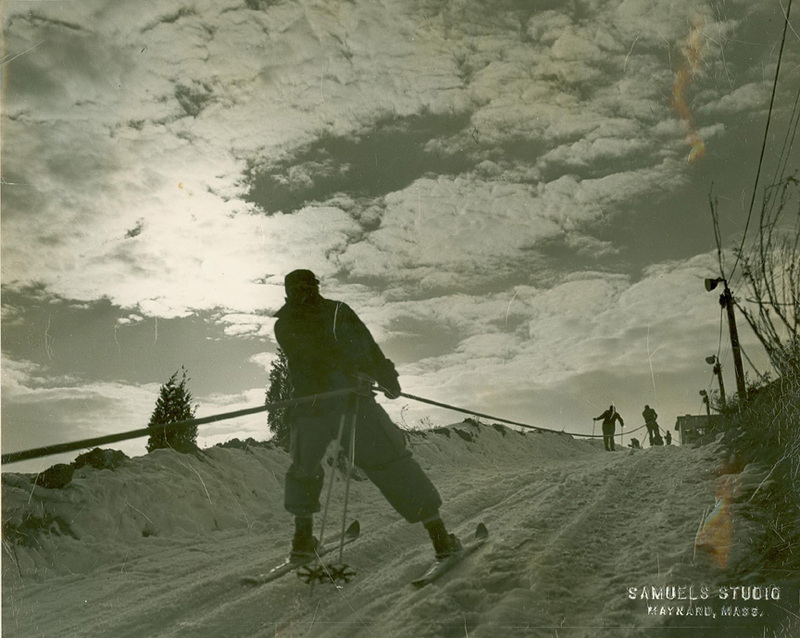 The ski instructor, George Savakoski, was a local mailman by day. A view of the rope tow. Note the outhouses across the street! Click on the image for the larger version. Riding up the rope tow. Note the lights for night skiing on the lift towers. Juniper Hill offered both day and night skiing (!) in its heyday. There were big crowds day and night. Of course, there was no snowmaking then, but one summer my father brought in some kind of artificial plastic snow “flakes” with dubious results. Operations ceased when the landlord raised the rent too high and used the land to build houses. Note the outhouses in the field across the street. Jerry Bird: "Juniper Hill had a rope tow running up it's approximate 300 vertical feet. By the time I was a kid sledding there in the late sixties the rope was long gone, put the poles were still standing. Juniper Hill is also known as Spindle Hill"
Robert Kitchen also confirms this area once existed: Just found your website and wanted to email you and let you know that Spindle Hill in Stow indeed had evidence of the ski lift/slope there until fairly recently. When we bought our house on the back side of Spindle hill (Gates lane) eight years ago there was an old overgrown dirt access road up the back side which led to some trails which were being used for hiking. There was one trail which ran straight down the hill and I was told by the former owner of our house was where the old tow line was for a ski slope. Sadly the land was developed a couple of years ago and the area is now houses. Bruce A. McGarry says, "I grew up in Maynard, Massachusetts and quite often skied at Juniper Hill in Stow. 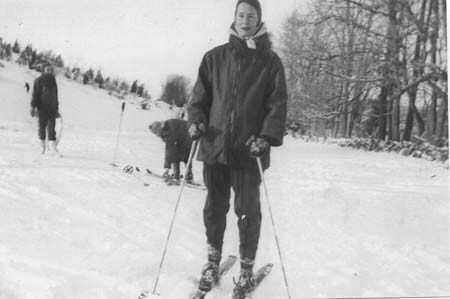 I learned to ski on a hill behind my house on Taft Avenue using my father's old wooden skis with leather bindings. Going to Juniper Hill was my first "resort", so to speak and I was greatly intimidated by everyone else there. As I read the article in AMC Outdoors I was reminded of one other aspect of Juniper Hill- tobogganing. We would go up there at night when it was closed and climb up the first rise for some great runs until we either got booted off or Dad would want to go home. It ended with a great crash into the stone wall that was at the bottom by the road- four kids survived- the toboggan didn't." Leslie (Anthony) Bowen: I remember this area, I grew up close to it and when I was a kid we sledded down the main trail, which was about 100 feet wide. The equipment for the rope tow was still there (pulley wheels and cables at the top), as well as the poles. That would have been in the early 1960's. The road that goes to the top off the back side of Spindle Hill was put in around 1970 for a house that was never built. Actually this hill is quite memorable because my brother went through a barb wire fence at the bottom on one of his sled runs. My mother thinks that is was operated in the early 1950's, she said that it was not in operation when they moved to Stow in 1954. Here is a photo taken by my father in 1963 at Juniper Hill in Stow, MA. You can see the remains of the tow building at the top and some of the poles. Anybody else remember this ski area?